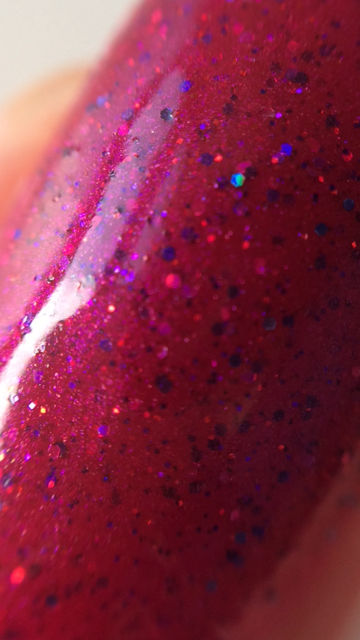 Dollish Polish Seduce me was released as part of the Valentine's Day set, inspired by 50 Shades of Grey. The set contained a hand cream, cuticle butter, body scrub and this gorgeous raspberry pink based polish with iridescent and holographic micro glitters and a micro red glitter. I got my set in the scent Red Velvet cake and it smells divine! I've been loving the hand cream and cuticle butter, but I haven't tried the body scrub yet, as I'm working my way through a couple before opening this one. The formula for Seduce Me is really nice, it's easy to paint, opaque in just 2 coats and it dries really fast and shiny. I would recommend using a top coat though, to get a really smooth finish. Isn't that pretty? I'm in love with this polish, even though it's pink. This is just the right kind of pink for my skintone and I didn't even want to take it off after just a day, like with every other pink polish I wear. Unfortunately, this set was a Limited Edition for Valentine's Day and is no longer available on the regular Dollish Polish website, but keep an eye on the Etsy page, you never know if it might show up there! I love Dollish Polish, she has a lot of great collections and I think she is the absolute best at naming polishes! What's your favorite Dollish Polish name? Vind de set wel echt superleuk! Jammer dat-ie niet meer te koop is! Oeh, sushi is altijd een goed idee!!! Wat een heerlijk lakje met die gekleurde glittertjes!